Beauty industry is on the boom. At present, the beauty industry is a $445 Billion market and is still evolving. Financial independence has given women the freedom to spend for their own pleasure and happiness which has resulted in the beauty industry boom. Women are now willing to spend a bomb for their own wellness and appearance. With the rising age of the internet it becomes all the more necessary that beauty service providers make their online presence felt so as to reach a large audience and tap in new segments. Whether you are a new entrant, a startup or the one already established having your own website increases your visibility and helps you reach all segments within your target area. Beauty industry relies on visibility and appearances this is why having a website that displays your work effectively is all the more necessary. There are high chances of conversion of visitors/ future prospects into your valued customers. A website that houses all the information about your work, your services and displays attractive photographs of your work done till now is highly beneficial. Just one website that is built and marketed by experts can do wonders to your business. 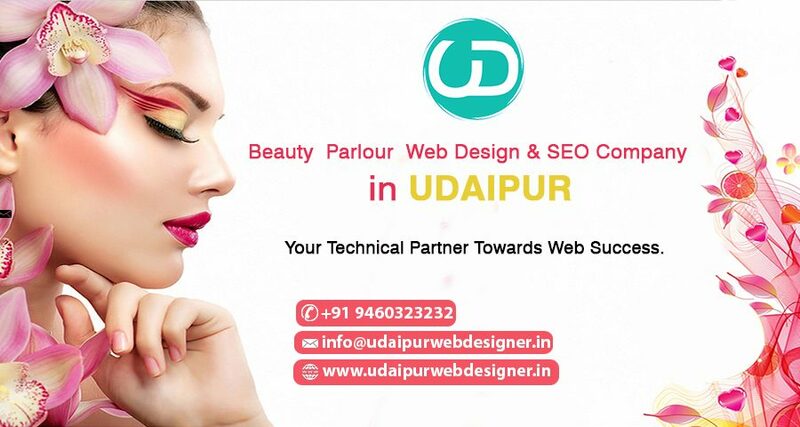 This is where Udaipur Web Designer. steps in to help you climb out of your restrictions and be a part of online renaissance. Udaipur web designer is a website designing and developing company in Udaipur. We are also a Digital Marketing Company in Udaipur that develops as well as markets your website. Beauty service websites developed by us have excellent robust designs. We include your beauty portfolio, success stories, picture gallery of your services etc. The content of the beauty service websites developed by us is prepared by experts keeping in view your services, special mentions about your notable work, lucrative display of your specialties and reader friendly descriptions. We focus on including both attractive components as well as visitor friendly techniques in our websites. This is why we claim to have biggest visitor engagement through our seamless flow of text, videos, imagery, audio and graphics. We also provide maintaining services at really affordable prices. As a Social Media Company in Udaipur we also help you carve out a market for yourself through targeting customers via Face book, Instagram, Twitter etc. We also provide Seo Services in Udaipur. Attractive design, eye catchy graphics, visually pleasing color schemes. Social media marketing through Facebook, Instagram etc. Don’t believe us yet? Call us or drop an E-Mail to book an appointment with us and witness a session that showcases you some of our finest works. Hire Udaipur web designer to witness a revolution in your business. Book an appointment at the earliest!